Back before sports cards became my favorite way to kill time... my parents took me to see Star Wars. And since that day... it's been one of my favorite film series. My obsession with Star Wars action figures, video games, and comic books have long subsided... but I'll still watch the original trilogy at least once or twice a year. 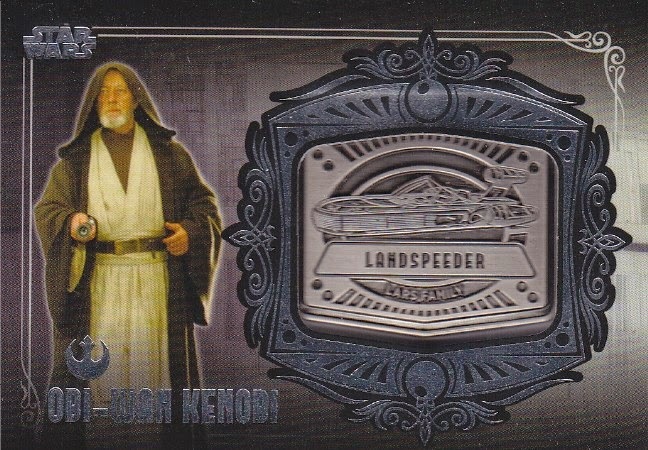 I originally wanted to purchase Boba Fett's Slave One medallion, but this card turned out to be much more affordable. You can expect to pay close to thirty dollars for a Fett, while these cards are routinely sold in the $8 to $10 range. And after going back and forth on whether or not to pick this up... I remembered how Kenobi sacrificed himself so that Luke, Han, Leia, and the droids could escape the Death Star. It's one of the coolest, selfless acts in the history of Sci-Fi cinema. "May the Fourth be with us all". I like the movies, but in really like watching the DragonCon gathering in Atlanta each year. True confession time: I've seen most, maybe all of the SW pics. And I still have no idea what the hell is going on in any of them. Lol. That's the way I feel about the Harry Potter films. I like the card but I'm one of the few people who aren't impressed by the franchise. I only saw the original movie for the first time during a theater re-release back in the 90's (I think). When I was a kid, I would have thought you were crazy. But as an adult, I realize certain things aren't for everyone. I still can't understand why people watch reality television... and I know a lot more people who enjoy that over SW. I went to high school with a distant relative of Alec Guinness. She really didn't appreciate all our Star Wars cracks. But that's what she gets for hangin out with the geek crowd. That's awesome. You're part of the Guinness six degrees of separation thingy. I was so into Star Wars as a kid that the trading cards were my first ever cards. Without those who knows if I would even be into baseball cards now. Now that's one of those stories you'll definitely be telling your grandchildren. Very cool. I saw the first 3 movies in the theater and that was it for me. But I remember the order of the Star Wars cards series: blue, red, yellow, green, orange. If you had to pick a trilogy, you chose the right one. As for the colors... I'm impressed. I remember having a bunch of blue, yellow, and green... but very few orange and I don't remember any red. I picked up a Tie Fighter medallion last year, they are very cool cards and thicker than you would expect. I plan on getting an AT-AT Driver, Darth Vader and Darth Maul medallion too, but they can wait. If I end up grabbing a few more... next up will be Boba and Han. But I'll only buy them if they're affordable. Not a Star Wars fan. Never seen a full movie. Just a few bits and pieces on TV when nothing else was on. It's okay Greg. I still think you're okay. If I could offer you some advice... give it a chance. Although if you're going to try it... I wouldn't start with Episode 1 (JMHO). I'm a fan of both too. I totally love the new ST movies... but if I could only choose one franchise, I'd have to choose Luke, Han, and Leia over Kirk, Spock, and Scotty. I'm going to fall right into the middle of these comments. I saw the first three movies in the theater and thoroughly enjoyed them. The second trilogy bored me, but I soldiered on and watched all three to maintain my greek cred. I one of those people who avoid the theaters at all costs... but have to admit I've seen all 6 in the theaters... multiple times. I liked all first 6 episodes which I guess doesn't make me a REAL fan. I like ep4-6 because i grew up with them and I liked learning how things came to be in ep1-3. Curious to how the next three will go but time will tell if they are any good. I was more into Star Trek myself than Star Wars. Love Star Wars! Empire Strikes Back was my favorite. Nice to see the bad guys win. Agree 100%. I'm a huge fan of Hoth. Wish they spent more time there. Star Wars fan here. I know it gets a lot of love on 5/4, but I reserve my SW geekout for The Festival of Lightsabers (the week between Xmas and NYE).. an annual tradition in my house. I've got a few action figures, but apart from that, haven't done much collecting in regards to SW. Would love to pick up sets of the original Topps set(s) one of these days. The Festival of Lightsabers sounds AWESOME! I too look forward to adding those original Topps sets to my collection one of these days. Now that's something I've never dove into. But you know what they say... never say never. They made Series 2 of that Galactic set? Oh, and while I enjoy both Trek and Wars, I lean more towards Trek. It's okay. I didn't realize they had a Series 1, until after I made this purchase. The Empire Strikes Back was the first film I was ever taken to, so I share all of your sentiments with Star Wars, Fuji. I have many childhood memories, and even more stories from the family of how obsessed I was with every aspect of the films, characters, and toys. Great Obi-Wan card...I wasn't aware these even existed.